MIAMI BEACH, FL -- May 21, 2010 – The Miami Master Brokers Forum (MBF), an organization comprised of South Florida’s top residential real estate agents, recently held an extraordinary dinner and panel discussion, hosted by The Residences at W South Beach. After arriving at the W South Beach, guests were treated to a lavish cocktail hour on the 12th floor, and toured several of the fully finished, exquisitely furnished, and exceptionally well-serviced residences, ranging in size from 556 to more than 3,000 square feet, all offering mesmerizing ocean panoramas and generous outdoor space. Guests were then ushered to a banquet room and formally welcomed by The Residences at W South Beach's John Albino and Katy Stoka. 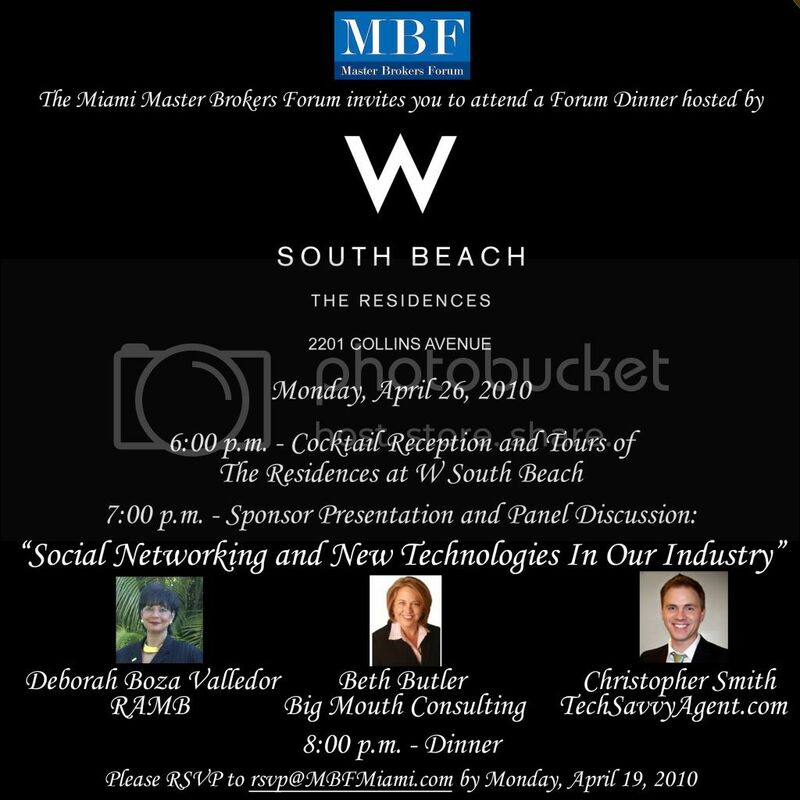 This was followed by a cutting-edge panel discussion on technology and social media, featuring Beth Butler of Big Mouth Consulting; Deborah Boza Valledor of the Realtor Association of Greater Miami and the Beaches; and Christopher Smith of Top Producer and the TechSavvyAgent.com blog. All three discussed the latest trends concerning Facebook, Twitter, and YouTube, with specific focus on how real estate professionals are maximizing these and other networks. Guests were treated to a wonderful buffet dinner after the discussion, plus prize drawings for $200 gift certificates for W The Store, MR CHOW, Soleà, the Bliss Spa, and a two-night stay at the W South Beach. All guests received a special offer for two-night stay at the W at a reduced rate, plus a $100 food and beverage credit. "My thanks and congratulations to Pat Klock Parker, Claudia Lewis, and Christopher Zoller, for co-chairing this amazing affair," said Emilio Palomo, Miami MBF chair. "We also extend our deepest appreciation to our wonderful hosts at The Residences at W South Beach, and to each of our esteemed panelists."